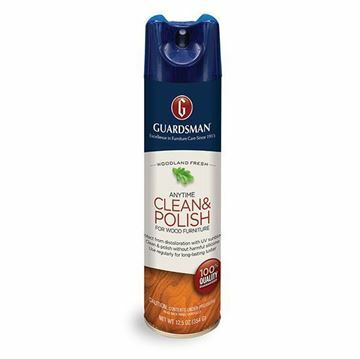 Guardsman has been a leader in furniture care since 1915, delivering quality products and services for the protection, care, and repair of wood, fabric, and leather furnishings and bedding products. 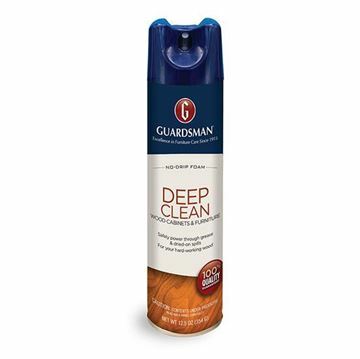 Backed by the strength of the Valspar Corporation, the world's largest supplier of wood finishes to the furniture and cabinet industry, Guardsman products include polishes and cleaners for fine wood, leather, and fabric furniture, as well as a complete line of furniture maintenance products for touch-up, repair and spot cleaning. Guardsman is also the leading provider of furniture protection plans in the countries where it does business, with more than 11 million protection plans in force throughout the world. We visit hundreds of thousands of homes every year to successfully repair furniture - so you know our products work! Leveraging Guardman's talented network of furniture professionals, Guardsman also offers on-site repair services to residential and commercial customers. Seals stone surfaces to prevent stains and etching. Maintains stone's look and feel. Safe for use on food-prep surfaces. pH balanced and biodegradable. Made in the U.S.A. IDEAL FOR USE ON: Granite, Marble, Travertine, Slate, and all other natural-stone surfaces. Enhances the luster and beauty of natural stone. 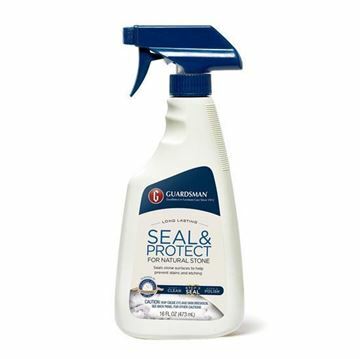 Resists water spots, soap scum & fingerprints. Safe for use on food-prep surfaces. PH balanced and biodegradable. Made in the U.S.A. IDEAL FOR USE ON: Granite, Marble, Travertine, Slate, and all other natural-stone surfaces. Easily and gently removes everyday dirt and grime. Non-streak formula. Safe for use on food-prep surfaces. PH balanced and biodegradable. Made in the U.S.A. Ideal for use on Granite, Marble, Travertine, Slate, and all other natural-stone surfaces. 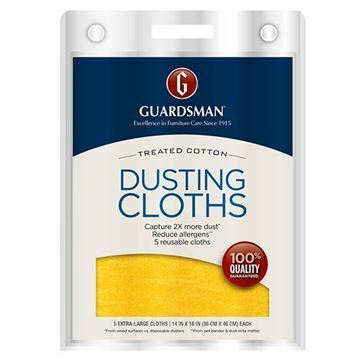 DUSTING CLOTHS, 5 COUNT - PRODUCT INFO: Specially treated, residue-free cloths trap and lock in dust. Fast and effective - one-step dusting, free from spray mists and odors. Cotton cleaning cloth won't scratch delicate surfaces. Rinse and reuse each cloth. Made in the U.S.A. Use regularly to keep dust at bay—ideal for all your dusting needs. Use on furniture, blinds, appliances, auto interiors, cabinets and paneling, glass and mirrors, ceiling fans, walls and railings. Also fits most floor sweepers—just fold in half, wrap around the sweeper, and attach as appropriate. Hand wash in lukewarm water with mild detergent and air dry. Cloth size: 14 in. x 18 in. (36 cm x 46 cm). WOODLAND FRESH ANYTIME CLEAN & POLISH , 12.5 OZ. PRODUCT INFO - Enhances wood's beauty, leaving a fresh woodland scent. Use regularly to clean, shine, and protect your wooden furniture Conceals fine surface scratches. Silicone-free to preserve the intended radiance of the manufacturer's finish. Made in the U.S.A. DEEP CLEAN PURIFYING WOOD CLEANER, 12.5 OZ. PRODUCT INFO - Quickly removes built-up residue such as dirt, oily films, and dried spills from wood furniture. Cleans free of streaks and dust-attracting residue. Great for regular furniture cleaning on wooden surfaces susceptible to heavy use, such as kitchen cabinets, tables, and chairs, as well for cleaning doors, paneling, and molding. Made in the U.S.A.